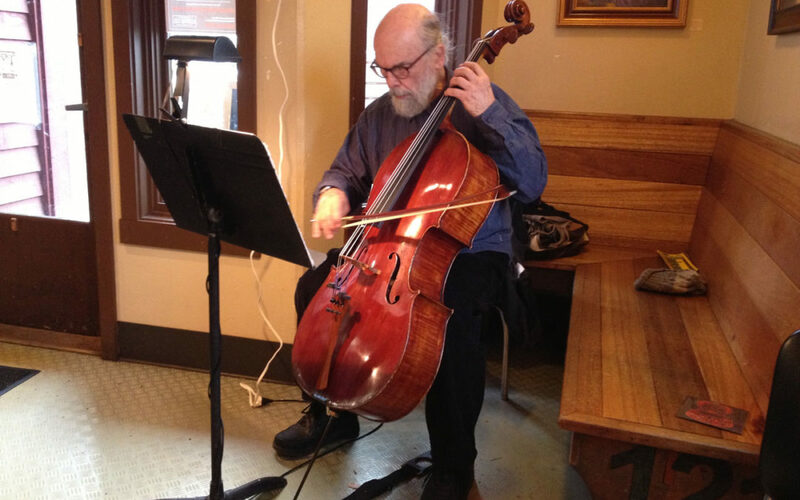 Prolific bassist, cellist, and educator Buell Neidlinger passed away March 16 in his Whidbey Island home. Neidlinger was best known for his early collaboration with iconic pianist Cecil Taylor in the ‘50s and ‘60s. He made a career working within a wide spectrum of musical styles, including jazz, classical, pop, and rock, performing alongside artists including Thelonious Monk, Charlie Haden, Tony Bennett, Chuck Berry, Frank Sinatra, Roy Orbison, Barbra Streisand, and many more. In 2000, Neidlinger and his wife relocated to Whidbey Island, where he continued to perform regionally on the cello, and occasionally on records on the K2B2 label. This giant of jazz will be missed. Karen Caropepe, Managing Director of Earshot Jazz, has been named the region’s 2018 Jazz Hero by the Jazz Journalists Association. Since starting at Earshot in 2005, Caropepe has managed the organization’s bookkeeping, grants administrating, marketing/PR, ticketing, desktop publishing, and much more. In 2015, she oversaw the exhaustive implementations of the new website and membership database. She can be found at every Earshot Jazz event running the front-of-house and backstage hospitality. She is devoted to the community she serves, and is one of the hardest-working advocates of the art form—a true Jazz Hero. From the Earshot Jazz editorial team, a heartfelt congratulations to Karen Caropepe! Please join us in honoring Karen, who will be presented with the award by JJA’s and KNKX’s Robin Lloyd, and the greater Seattle jazz community at the annual Golden Ear Awards ceremony on Monday, April 2, at The Royal Room. The beloved Café Racer has reopened its doors, ushering in a new era of weekly improvised and experimental music. On March 4, Racer Sessions co-founders Neil Welch and Chris Icasiano performed as duo Bad Luck to inaugurate the series on the stage where it all began more than eight years ago. In 2017, original owner Kurt Geissel announced he would be selling Café Racer, causing a stir in the community it served. Now under new ownership, the café celebrated its grand reopening early in March. As the community has welcomed back the café with open arms, so too has the establishment welcomed the artists and musicians who had found a home there. As good improvisers do, the creators of the Racer Sessions were able to keep the series afloat, finding various venues throughout the city to host on Sunday evenings. But as of March 4, the series has returned, for the foreseeable future, to its hallowed ground. Upcoming events this month include: April 1, Nathie Katzoff; April 8, Tom Scully/Jeb Polstein Duo; April 15, Griffin Boyd; and April 22, Fenja Frances. Racer Sessions are held at 8pm at Café Racer (5828 Roosevelt Way NE), and are always free, all-ages, and open to the public. Seattle Women’s Jazz Orchestra (SWOJO) is now accepting scores for its sixth annual jazz composition contest. The winning and honorable mention composers will receive an honorarium and their compositions will be performed and recorded live by the Seattle Women’s Jazz Orchestra with a special guest during the 2018 Earshot Jazz Festival in Seattle. Submission deadline is June 30. See swojo.org for details and online application. The contest was created to encourage the composition and performance of the highest quality jazz ensemble literature playable by high school, college, and professional bands. This project supported in part by Seattle Office of Arts & Cultural Affairs, 4 Culture, and The Seattle Foundation. Bellingham’s Friends of the South Whatcom Library kicks off its 2018 Sudden Valley Jazz series on Saturday, April 14, with New York reedman Evan Arntzen, along with his brother, guitarist/banjo player Arnt Arntzen, in a quintet that will be playing both swing and Dixieland music for listening and dancing. Then, on May 5, Olympia-based vocalist LaVon Hardison performs with her quintet of Eric Verlinde (piano), Osama Afifi (bass), Jeff Busch (percussion), and Jerome Smith (tuba, trombone). The series takes a hiatus through the summer, before starting up in the fall on October 6 with Jeff Busch’s Magic Circle, and wraps up on November 10 with Kevin Woods’ Tribute to Miles Davis. Sudden Valley Jazz performances take place at 3pm in the Sudden Valley Dance Barn in Bellingham. Seating is limited, and drinks are available for purchase at the concert. Both series tickets ($70) and single concert tickets are available at fswl.org. Mark Your Calendars for GiveBIG! The Seattle Foundation’s eighth annual GiveBIG day is May 9. On this day of giving, maximize your gift to Earshot by participating in this community giving event. You can help with a donation at any level. Each donation made between midnight and midnight PDT will receive a prorated portion of the matching funds. Find more information at givebigseattle.org. Jack Straw Cultural Center is proud to announce the artists who have received awards in its 2018 Artist Support Program. Twenty artists/artist teams were selected by a panel to complete projects in the Jack Straw studios. The 2018 Jack Straw Artist Support Program Residents include: Kay Ray, whose project is audio production for the documentary film In Her Hands: Key Changes in Jazz, exploring obstacles facing women in jazz today as women around the U.S. are fighting for auditions, creating opportunities, and being role models for young musicians; Marge Rosen/SWOJO, who will produce recordings of winner and honorable mention compositions from Seattle Women’s Jazz Orchestra’s annual international jazz composition contest for women composers; and saxophonist Wally Shoup, who will record four different trios. For more about the Artist Support Program, visit jackstraw.org. Additionally, through June 17, a special exhibit of Seattle on the Spot: The Photographs of Al Smith, will be on display in the Jack Straw Atrium Gallery. Instrumental Ladies of Jazz, a showcase of Seattle jazz women, continues at the Caffe Musica in Greenwood. Coming up, Ann Reynolds (piano) will be joined by Amy Denio (clarinet, alto sax) on April 20; Leah Pogwizd (bass) on May 18; and Kate Olson (soprano sax) on June 15. Presented by Caffe Musica, Instrumental Ladies of Jazz is a series dedicated to showcasing women instrumentalists who play jazz in Seattle. Performances are the third Friday of each month, from 7 to 9pm, at Caffe Musica (14300 Greenwood Ave N). The Ballard Jazz Festival (May 16–19) is seeking volunteers for the annual event. Interested volunteers should fill out the online form at ballardjazzfestival.com, or contact Volunteer Coordinator Paul Rauch at volunteer@ballardjazzfestival.com. The Seattle Office of Arts & Culture is opening a new arts and cultural hub on the third floor of King Street Station this winter and the inaugural exhibition will be yehaw. The title of the exhibition, yehaw, is drawn from the Coast Salish story of Native people from all tribes uniting around a common cause and lifting up the sky together. In the spirit of the story, this exhibition will celebrate the depth and diversity of Indigenous art made in the Pacific Northwest. In preparation for the exhibition, curators Tracy Rector (Seminole/Choctaw), Asia Tail (Cherokee Nation), and Satpreet Kahlon opened a call for artwork in any media by Indigenous creatives living in the Pacific Northwest. Deadline for submission is April 20. All Indigenous creatives who apply will be included in the exhibition. The exhibition will be a collective portrait of Native America, including creatives of all ages and stages in their careers, from many tribal affiliations, working in a variety of creative mediums. yehaw celebrates all Native makers, and actively challenges the false divides between fine art and craft, Urban and Reservation, contemporary and traditional. For more information, including guidelines, eligibility, and the application please visit yehawshow.com.